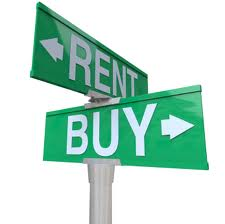 Many potential homebuyers often are faced with the dilemma of buying vs renting. According to a recent article by Nick Timiraos of the Wall Street Journal, purchasing a home is still a better deal than renting in every major United States housing market. And, as long as mortgage rates remain below low, this will continue to be the case. Even though there has been a recent increase in mortgage rates, this is not expected to directly impact the current housing activity. Applications for refinancing rose by 5% last week and applications for home purchases also rose 5% for the week, and even stood 14% above their year-end levels. The online real-estate site Trulia has researched specific markets in the U.S. to determine how high rates would have to move to actually make renting less expensive than owning. It is expected that these rising rates will have a larger impact in the more expensive housing markets, such as in San Jose or San Francisco. However, for the remainder of the country, rates would have to become significantly higher to make renting a home more affordable than owning one. Trulia estimated that in the majority of markets, rates would have to rise significantly for the cost of owning a home to exceed the costs of renting. For example, rates in New York and Orange County would have to rise to 6.8%, while rates would need to increase to 7.5% in Los Angeles and San Diego. And, in many of the so called “hard-hit” cities or areas of the industrial Midwest, where homes can be bought for a very low price, rates would have to even be significantly higher. According to Trulia, this includes 17% in Akron, Ohio, above 20% in Cleveland and Toledo, Ohio, and rates would have to rise to a staggering 35.8% in Detroit in order for renting to be less than owning a home. Trulia concludes that it is still a better bargain to own a home is mainly due to the home prices falling so far after the housing crash, while the price for renting a home hasn’t fallen nearly as much. So, from this information, buying a home is still a much wiser decision than renting. If you are in the market to buy a home, please feel free to contact me and we can get you started on your way to owning your dream home!